It has become an annual tradition at Jackson’s! 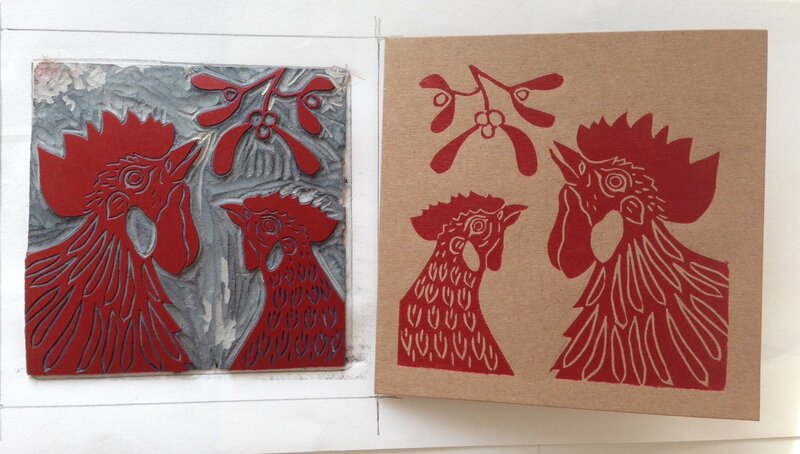 Each year we ask artists to submit a photo that will encourage people to make their own linocut Christmas Cards. 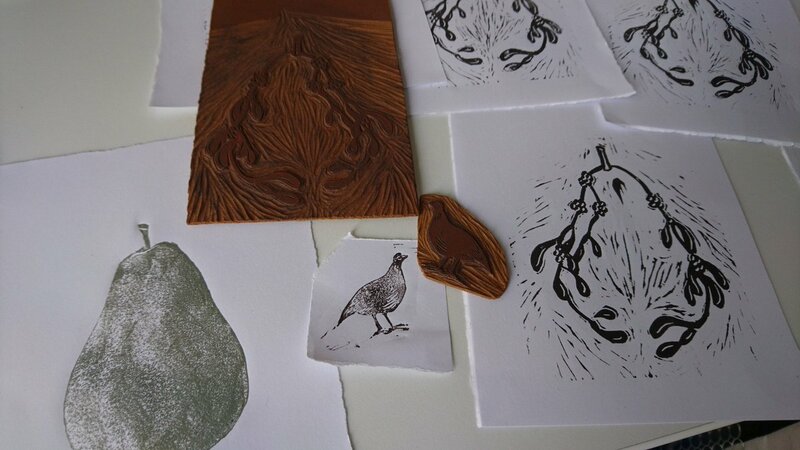 Since there are so many lovely, skilled printmakers on Twitter we always do the photo competition there. Every year we get some great photos from creative artists. 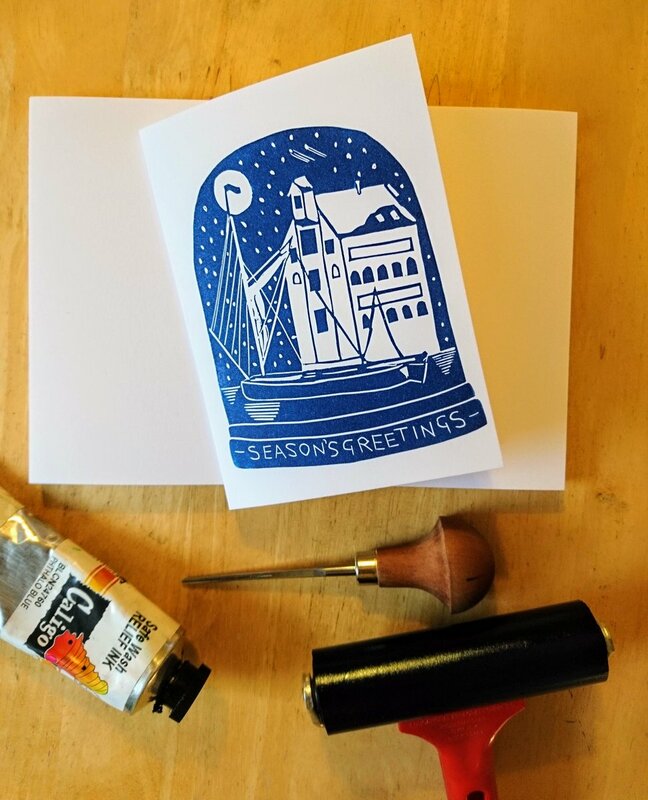 This year we have a winning image from Andrea Clement that will feature in our newsletter about printing your own cards. 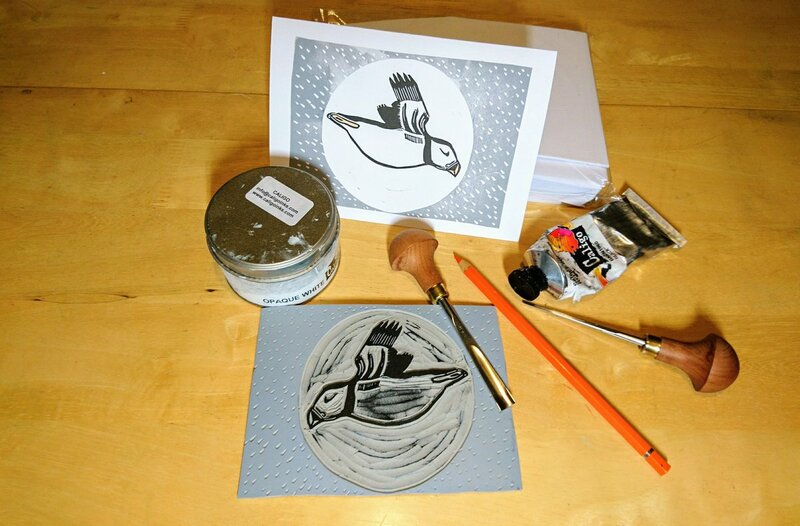 In addition to it being a beautiful card design it is a great photo layout for inspiring cardmaking, with the carved lino block, the tools and the multiple printed cards all showing. 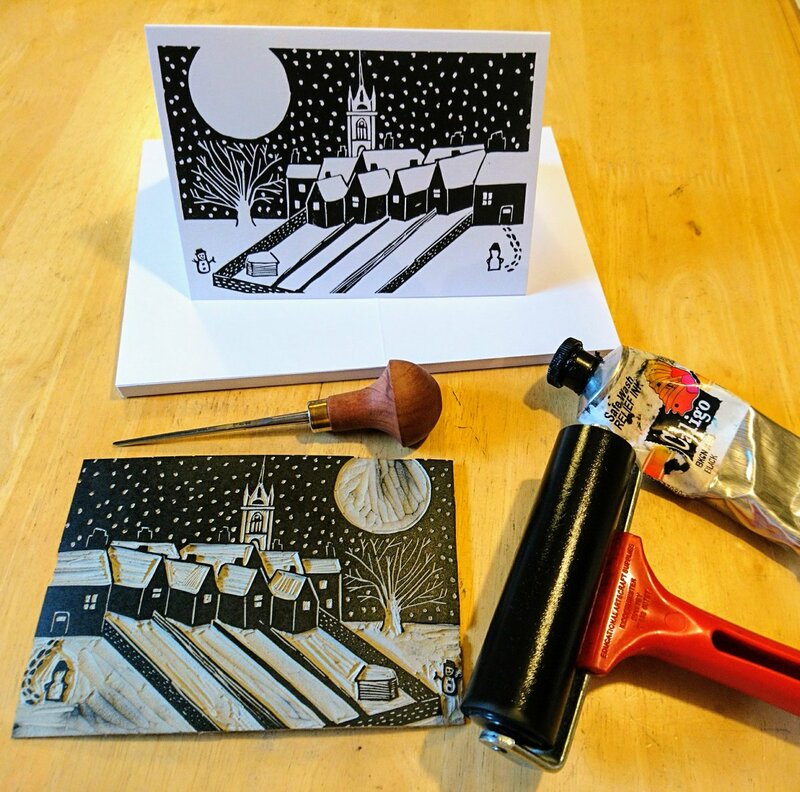 Thanks Andrea, we think your great photo will inspire people to try making cards this year! Andrea will receive a £50 Jackson’s gift voucher. We have also commended the really good photos from eight artists who will each receive a tube of Caligo Safewash Relief Ink. 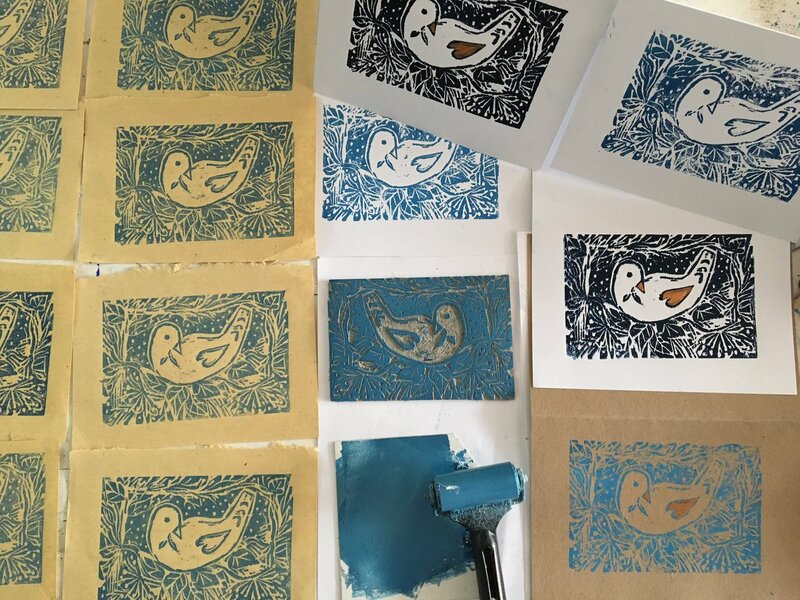 Andrea Clement’s @Andreajane71 great photo of linoprint cardmaking – a folk-themed dove design. 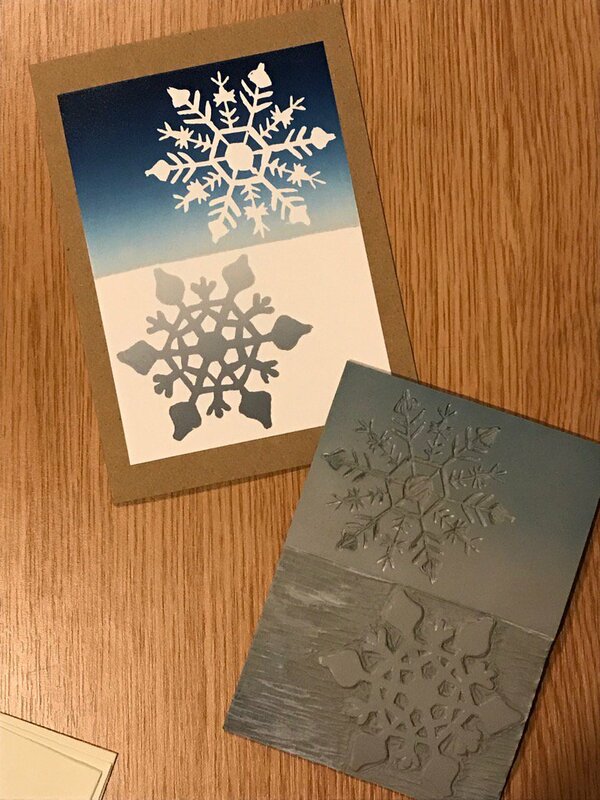 Andrea also submitted another beautiful photo that also uses large areas of blue ink to set off the snow-coloured paper, to great effect! 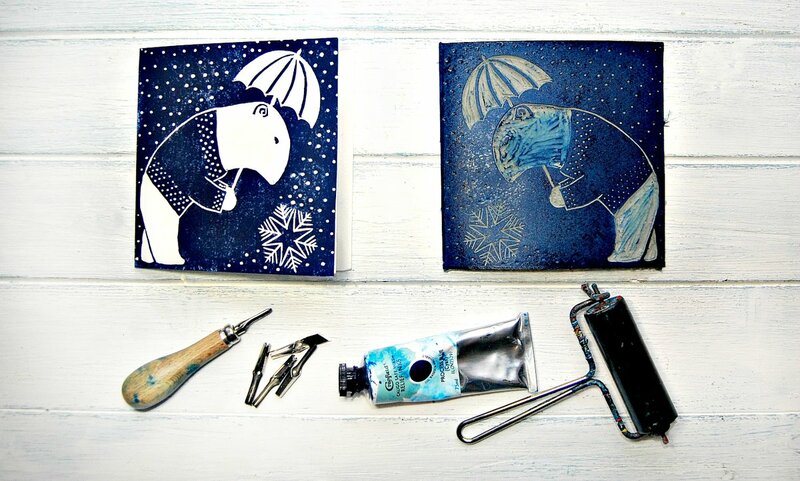 More creative cards using linocut printmaking! Christmas Chickens 2017! Going jolly Red! 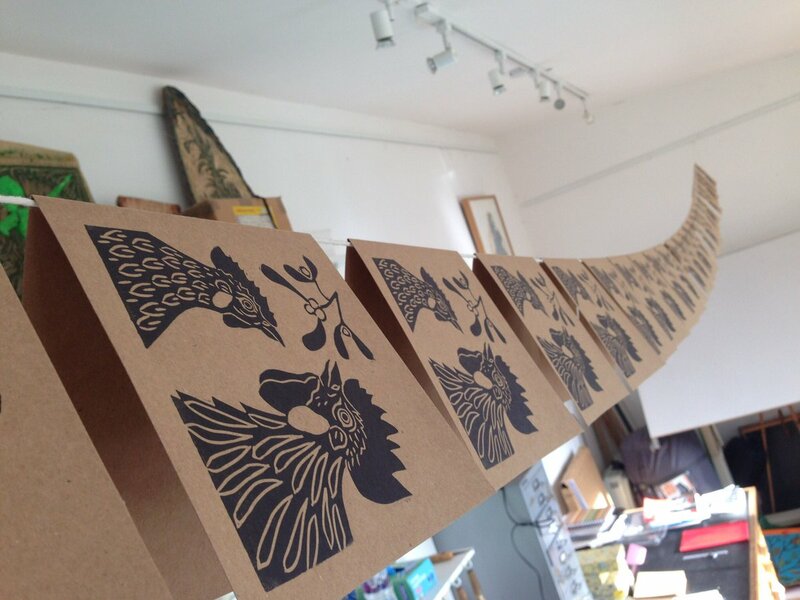 The tricky Puffin who tested my printmaking patience straggling at the back as usual! Note the Important Orange pencil! Phathlo Blue depiction of my local creek, Oyster House & a Thames Barge in a Snowglobe. Glistening black ink and snowy black skies. 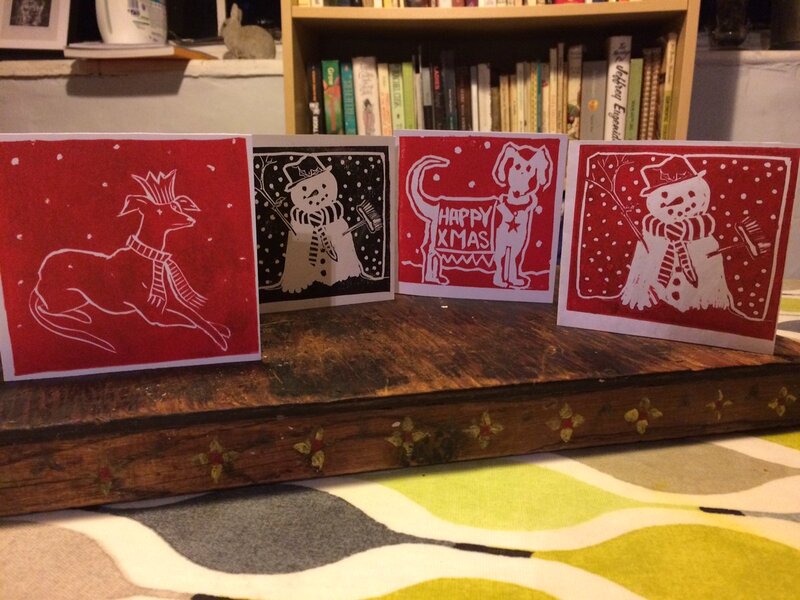 Four cards – dogs and snowmen! 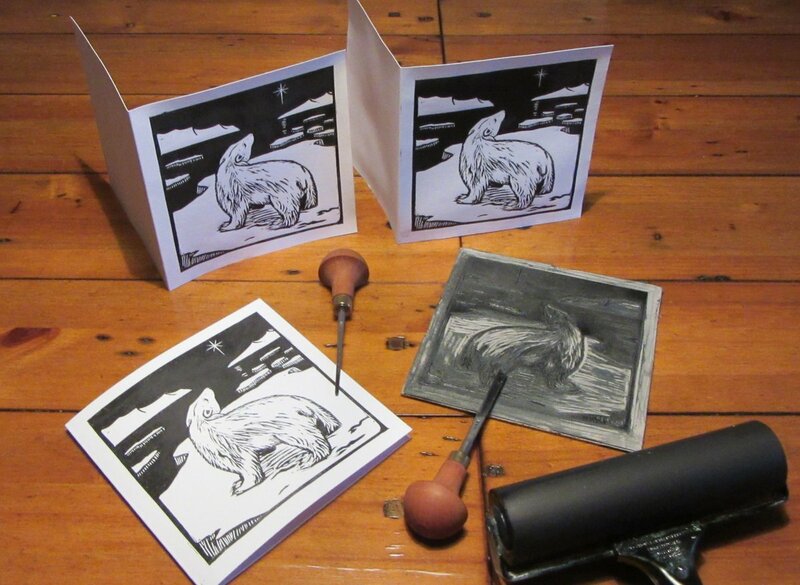 Some work-in-progress card printing. I love the mistletoe in the pear shape! Peace dove with different papers and inks. 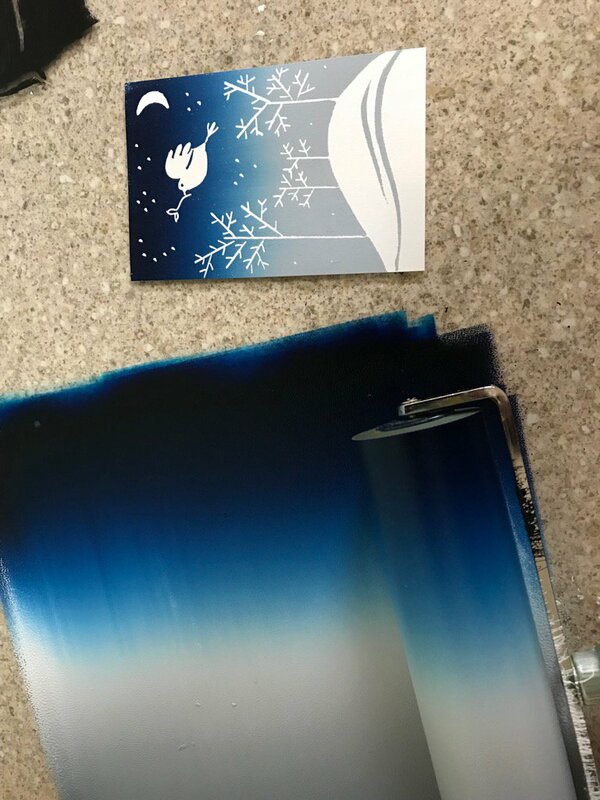 Great skill with a rainbow roll ink gradient! A lovely rainbow roll ink gradient! 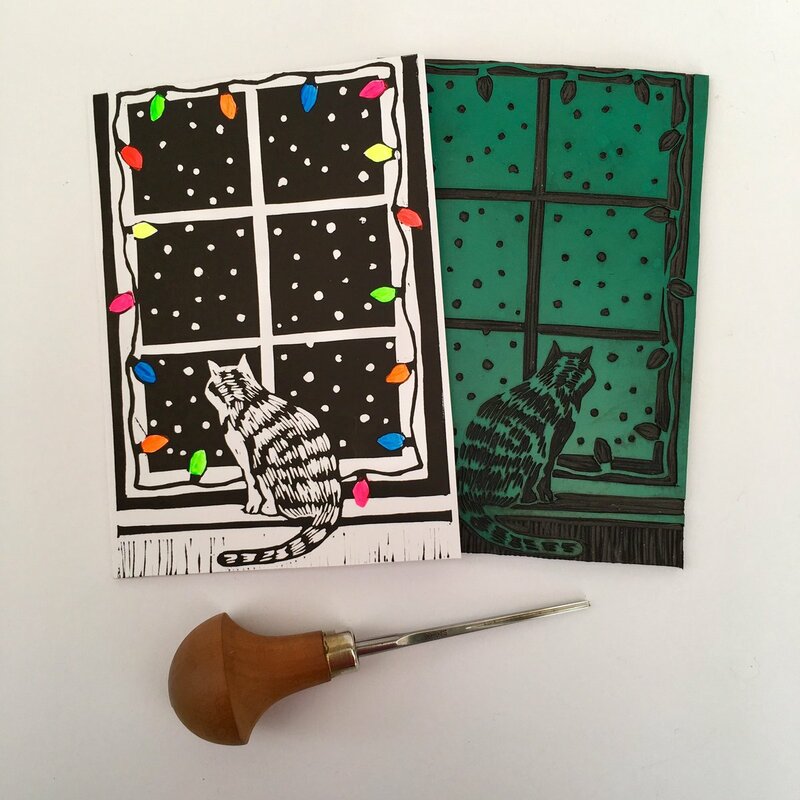 We hope these great examples of printmaking will encourage you to have a go at making your own linocut Christmas Cards this year! 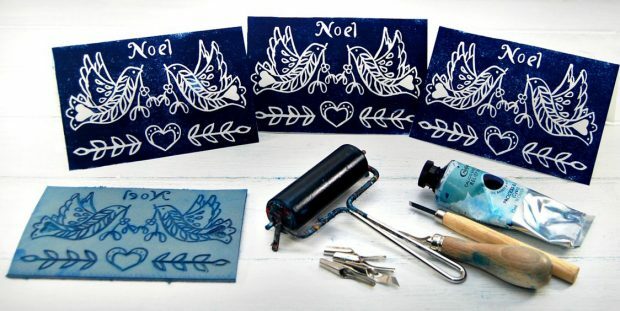 How to Make Your Own Linocut Christmas Cards. block and ‘pulled back’ into beads. no difference – suggestions welcomed. soft cut. Brush away any rubbings and then try inking up.